Before I started this book, there was a big part of me that believed there was no way I could be satisfied when I was done. There were simply too many questions to be answered, too many loose ends to ever tie up in a way that both made sense and appeased my need for a happily ever after. I was wrong. There is so much packed into these pages that when I think back to the question, “Who is the beast?” it seems like a lifetime ago. It’s no wonder you don’t get much information from the summary regarding what this book is about (it mostly recaps the series as a whole.) I find that even trying to talk about it in generalities reveals fantastic developments in the plot. 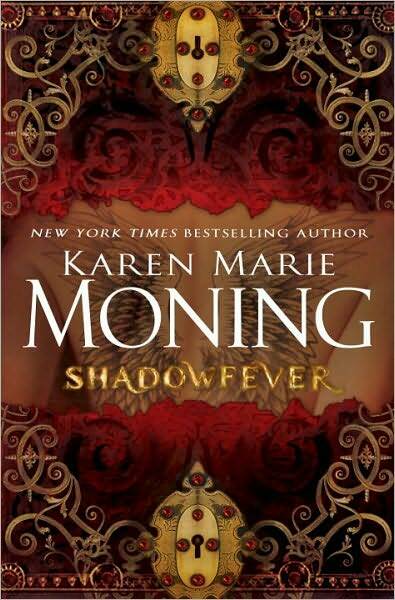 So if you haven’t read Shadowfever yet, I urge you to avoid the spoilers below, with my reassurance that it’s a fantastic book that left me wholly satisfied and warm inside. The first chapter of this book shredded me. (*spoilers*) When Mac thought she had killed Barrons, I cried for her. I ached. Then I watched her put herself together; to take the hard lessons Barrons taught her and live, so that his death was not in vain. This is not the Mac of Darkfever. She is powerful, but hollow. She finally gets her showdown with the Lord Master, but his death is decidedly anticlimactic. I felt cheated. But I guess that was the point. Mac seemed to learn so much about herself and her feelings with Barrons’ death. It was disappointing to see so much of it go out of the window when they were finally reunited. She was ready to end the world for him, yet suddenly, overhearing a phone call makes her regress utterly? It was one of the few parts of the book that left me frustrated. It was hard to see the roles reverse between Barrons and Mac… to see him so vulnerable… And when she finally looked inside his mind and learned what he was feeling while she was Pri-ya… Sigh. Without spoiling the details, I can tell you some of the questions that are finally answered: What is Mac? Who killed Alina and why? Who is the Unseelie King? Who is the King’s consort? Who is the Dreamy-Eyed Guy? Who is Cruce? Who was the dying boy in Barrons’ memory? What is under the garage? And perhaps the best question of all… who is the real villain in the story? The answer to that last one blew me away. Karen Marie Moning has created a tale of twists and turns that kept me guessing until the very end. NO ONE should read this book without reading the other books in the series first. And after reading this fifth installment, I’m sure many fans will go back to the previous books and read the stories from a new perspective, knowing truths we never dreamed of when it all began. There are enough threads that I can easily see more books in this Fever world, but I promise there is no cliffhanger here. Just a fantastic ending to a creative and enthralling story. I’d give it more than 5 stars if I could. I need to read these books Jen. I have them but I just haven’t gotten a chance to get to them yet! This book is at the TOP of my favorites, It surpassed my expectations, so, I’m really glad you appreciated it too! I can’t imagine what book will ever top Shadowfever though…. That spoiler feature is nice.